Take your cake tin and line it with something. The recipe recommends butter, but this doesn’t work terribly well. Last couple of times I’ve tried Tinfoil. If you really, really want to use tinfoil, then do, but the shear effort it takes to line the cake tin in tinfoil would be better spent walking to the local supermarket and saying “What ho, fine supermarket, sell me one roll of your fine grease-proof paper, if you would be so kind”, including the resultant time with people looking at you funny. 3×8oz packets of cream cheese. You can use spreadable “soft” cheese for this too, but if you see something that says “Cream Cheese” buy that instead. You will need a whole cup of each of sour and double (which Americans call “Heavy”) cream. Shockingly enough, an official ‘cup’ is about a the size of a tea mug, or about half a pint. Certainly so long as you’re consistent, it’s not really vital. It’s important to note that this is one of the middle size of cream availability, or close enough to it for jazz. If your moronic Helpful Local Supermarket Delivery Collective are stupid enough to supply you with the smaller size, take the time now to go forth and send a minion to fetch more stuff, whilst you model the evil empire of Sainsbury’s in some kind of computer game purely so you can take them out with a tactical nuke. Bikkits in this case are defined as “digestive bikkits” if you’re British, Graham’s Crackers if you’re American, and “the crumbly dark brown ones that may usually be covered in chocolate” if you’re neither. You’ll need about a cup of these, too. How do you measure a cup of a non-cup-shaped solid substance? This is simplicity itself. Take an amount of bikkits, and hit them with a hammer until they fit into the cup. This strategy works with most things. Get about five tablespoons of melted butter. You can do this by putting about half a block into the microwave and nuking it for a minute or so. Summon all your hopes and dreams that have been dashed upon the hard rocks of reality, and apply the resulting frustration to a small tower of biscuits until they break down into their component crumbs. Add these to the yellow goo, mix in 3 table spoons of brown sugar, a tablespoon of cinnamon and a tiny, tiny amount of nutmeg (The recipe said half a teaspoon. This is accurate if you really, really adore the taste of nutmeg) and stir until it’s consistent slush. Pour this slush into the bottom of the cake tin and bash until it’s level and coats the bottom of the tin. Personally, I recommend using a potato masher for this task. Hit it and make it as level as you can, or until you get bored. If you realise at this stage that you’ve totally forgotten to add the sugar, then sprinkle it over the top. Bung the kit and caboodle into the oven for 10 minutes. Or, ignore the oven bit entirely and do the next bit. Bung the cream cheese and a cup of white sugar into a bowl and vent frustrations for a while, or put it into an electric mixer. Either way, you want smooth gritty stuff. Add both types of cream (A cup of each) and attack. Add a tablespoon of Vanilla extract, and three tablespoons of plain white flour. Attack mercilessly until it begs for forgiveness. Take the index finger of your right hand, or a spoon, and swipe it though the mixture. 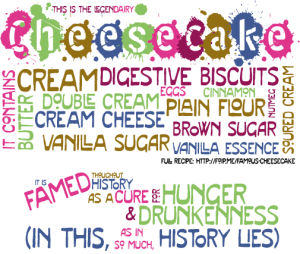 Now lick the cheesecake stuff from your finger or spoon. This is important, because it tastes really nice, and we’re about to add raw eggs, after which you really shouldn’t eat it until it’s baked, so savour it for now. Add the eggs (Three of them) one at a time, avenging your lost loves upon the ghost of cheesecake past between each egg. Pour the pure white fluffy white goo upon the dark, forbidding ground of the Biscuit Mix That Time Forgot and bung the entire unholy creation into the Place Of Heatedness for a while. Every half hour or so, withdraw it from its personal hell and stab it politely and diagonally with a long knife. If the knife comes out clean, it’s cooked and should be withdrawn from the fiery pit and placed on the rack until cooled. Then, it must suffer six hours purgatory (at least) in the Place Of Coldedness. Here you must suffer purgatory too, for you must remain aware that there is a freshly baked cheesecake in the fridge, but you must leave it pristine and uncut for at least six hours. 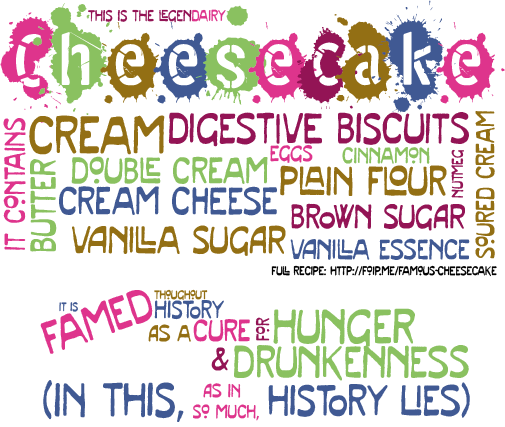 Hell is a cheesecake you cannot eat.